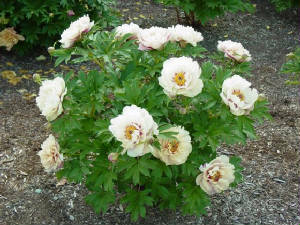 Paeonia is an international newsletter for peony hybridizers. It was published quarterly from April 1970 to spring 2002. Paeonia was started in 1970 by Silvia Saunders (daughter of Prof. A. P. Saunders) and was published continuously until the end of 2001. From approx. 1971-1994 Paeonia was edited and published by Chris Laning of Kalamazoo, Michigan. Starting in 1995, Paeonia has been edited and published by Don Smith of West Newton, Mass. A new data base of pedigree charts for more than 25 modern advanced generation tetraploid herbaceous hybrids has been generated and added to the Herbaceous Hybrid page of this site. To view the pedigree charts in this new data base click the link below. Most of the hybrids included in this new data base are presumed to be tetraploid, although a few are presumed diploids. To my knowledge, none have actually been tested. Most of these hybrids are very fertile, some both ways. As a result, many of these new AGHH's are being used extensively for hybridizing and are producing some outstanding new advanced generation hybrids. Many of these hybrids have long pedigrees that extend out to the 7-9th generation and contain as many as 5-7 different species. None are the work of a single breeder, as the accomplishments of most hybridizers are made by builting upon the work of those who have gone before them. Some of these new hybrids are the result of the combined efforts of 5 or 6 different hybridizers spanning more than 75 years. It is my hope that both serious and amateur breeders will find this information helpful in planning their breeding programs or at least interesting and educational. Paeonia Archives of back issues were updated as of 3/15/2010 with the addition of issues from the years 1971 and 1987. The database is now complete going back to 1987. Currently, there are 60 back issues of the newsletter available for downloading and more will be added as time permits. I hope you enjoy this on-line newsletter. Be sure to sign my guestbook at the bottom of the screen or send e-mail to let me know what you think (or to contribute articles or ideas). I'll be updating frequently, so check back often! Click below to view and download for printing the current issue of the newsletter. In order to do this you will need Adobe Acrobat Reader installed on your computer. This software is free to everyone and if it is not already installed on your computer, it can be downloaded from the Adobe Web site at www.adobe.com. 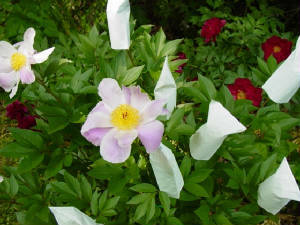 By going to the Recent Back Issues or Archives pages of this Web site you will find many other recent and older issues of Paeonia that are also available for downloading. Having trouble viewing, printing or downloading the above files? Click below to get detailed instructions that are likely to solve your problems.